As a partner in a scuba diving shop, I understand only too well, the effects of minimum wage, and the feel good ideas behind the Lilly Ledbetter Law. Congress may pass all the laws it likes, the president at the time may sign them into law, yet they become meaningless to those living in the real world; not shielded by the make-believe world of the rarefied air breathed by those that live in Washington and believe themselves to be our masters. Lost upon them is the definition of worth. Worth is simply what an individual is willing and able to pay. Thus, had we been able to pay a sixteen year old kid, living at home three dollars an hour at the time, rather than the mandated minimum wage it would have been a win-win situation. The young person could learn the beginnings of many skill sets while at the same time we could have afforded to pay them. This type of legislation typically leads to more unemployment in all areas, and Dianne Feinstein as California’s U.S. Senator should be well aware of that. California currently leads all states in state and sales taxes. Is there any wonder why business owners shut down as we did? Is there additional wonder among Dianne Feinstein and Barbara Boxer why jobs keep leaving their state for more business friendly environments, within the U.S. or overseas? To fail to understand such simple economics and yet continue to call for new taxes which the Lilly Ledbetter Act essentially was upon the employer, is not the mark of a leader but that of an ideological zealot pursuing a tax and spend agenda no matter the cause. In their latest play for female voters, Senate Democrats have begun laying the groundwork for a legislative fight over equal pay next month. Of course Dianne Feinstein was among those leading the charge. Senate Democrats intend to set up a procedural vote after next week’s recess on the Paycheck Fairness Act, which would update the Equal Pay Act signed into law June 10, 1963. Of course Mikulski or her lefty fem’s have not bothered to look at the facts and the reasons behind the alleged continued inequality. But wait a minute we can’t just take the economist above’s word can we? In the interest of “fairness” we must consider the august wisdom of none other Rachel Maddow. Incapable of being embarrassed they found, of the five senators who participated in Wednesday’s press conference—Barbara Mikulski (D., Md. 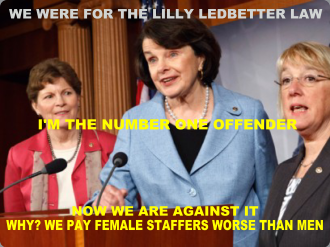 ), Patty Murray (D., Wash.), Debbie Stabenow (D., Mich.), Dianne Feinstein (D., Calif.) and Barbara Boxer (D., Calif.) three pay their female staff members significantly less than male staffers. Predictably Feinstein, treated her female staffers the worst, they also made about $21,000 less than men in 2011, but the percentage difference, 41 percent, was even higher than Murray’s. Dianne Feinstein has been “TOO WRONG” FOR “TOO LONG.” It’s time for Elizabeth Emken to turn Feinstein’s wrongs RIGHT. 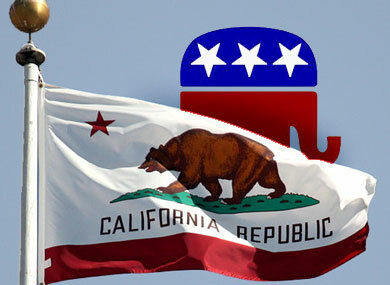 Elizabeth Emken has been endorsed by the California Republican Party, and the National Tax Limitation Committee. Congress already passed equal pay legislation in January 2009. President Obama has frequently touted that bill—the Lilly Ledbetter Act—as the first piece of legislation he signed upon taking office, and has sought to declare “problem solved” on the issue of equal pay for women.